Swedish journalists and members of the Palmetto Council for International Visitors, Jim Byrum and Lisa Ewart, stand outside of the State House in Columbia, South Carolina while on a tour of the city. 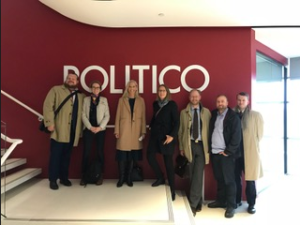 Swedish journalists visiting Politico in Rosslyn, VA, during 2018 U.S. midterm elections coverage. The Swedish-U.S Foreign Policy and Media Exchange program, organized for the U.S Embassy in Stockholm by Meridian International Center brought seven central and southern Swedish journalists and editors to the U.S. from November 3-9, 2018, to examine the contemporary landscape of U.S media and political journalism. This program explored the media’s role in navigating and covering today’s political climate, challenges facing traditional media and the future of transatlantic writing. 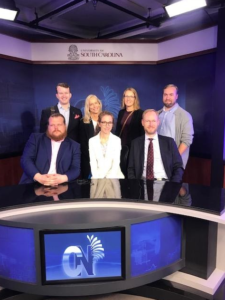 The group of Swedish journalists met with news organizations in Washington, D.C and in Columbia, South Carolina, including Politico, Axios, the Heritage Foundation’ media and communications department, The University of South Carolina’s communications department and COLAToday, among many more. Meridian: What motivated you to apply for this exchange program, and what do you hope to learn? 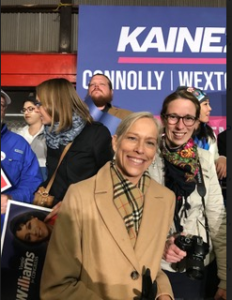 On Sunday, November 6th, the Swedish journalist group attended a Prince William County Get Out the Vote Rally in Manassas, VA. They were able to interact with Prince William County locals and speak with delegates and members of the local government. Meridian: Why is it important for you to be in Washington, D.C. right now during the 2018 U.S. midterm elections? Meridian: Do you have any previous experience covering US elections in-country? If so, how does the climate compare then to now? Kajsa Kettil Political Editor, Jönköpings-Posten: “The rally [Prine William County Get Out the Vote Rally] was so spontaneous, for us being curious about politics, and so it’s another dimension of knowing it [politics] and I think that can be useful when we go back to Sweden and write texts. For example, we can use our new friends [as sources and subjects]. It will be easy for our readers to get to know what really happened, like a scene or something, and we can put it in a Swedish context and see what is different and what is similar. For example, the polarization between democrats and republicans, we can see it in Sweden, but not as much as here. While visiting the University of South Carolina, the journalists from Sweden were able to tour the communications department, seeing production studios for the student run news station. Meridian: What has been the most memorable experience and/or impression in this midterms exchange program? Jakob Styrenius Editorial Writer, Västerviks-Tidningen: “The rally was the most memorable. The most interesting and stimulating though, is being here in South Carolina. The tour we took of the city was very rewarding, it’s important to understand this region. Meridian: What lessons or insights are you taking home? How do you anticipate applying and/or sharing with your community? POST TAGS: DC, journalists, Media, midterms, politico, sweden, Washington.